We learned this morning about another inexplicable mass shooting, this time in southern California. Though details continue to emerge, the news media has reported at least 12 deaths. We also know that the shootings took place in Thousand Oaks, not far from a sister campus, CSU-Channel Islands. In fact, several other college campuses are in close proximity to where the incident took place and were likely impacted in some way by this latest act of indiscriminate violence. There is a gut-wrenching feeling many of us experience when such events take place, particularly when we may have personal connections with the victims and those close to them. It seems like only yesterday that we mourned the loss of life in Pittsburgh and Kentucky after the recent shootings there. The SJSU community grieves for those impacted by last night’s horrific events. We join our CSU-Channel Islands colleagues and peers, as well as others in the greater Thousand Oaks community, in solidarity, sadness, and mourning. Again, I would remind everyone about the range of services we offer to students and employees who may feel weighed down by grief, fear, anxiety, anger, or isolation. Those services include counseling and psychological services, and support through our Employee Assistance Program. Please continue to take care of yourselves and those close to you. Especially at times like this, it is important that we affirm our values for inclusion, equity, diversity, and basic safety for all of our campus communities. As classes begin for this Fall 2018 semester, and as we celebrate the return of our faculty and students, I am delighted to welcome each of you to a new academic year full of promise and new challenges. As I am sure you feel as you walk the corridors and pathways of our campus today, San José State is humming with energy, enthusiasm, and hope for the possibilities that this year will bring. I am looking forward to sharing this transformative year with all of you. I particularly want to offer a heartfelt greeting to our extraordinary student body. This fall, we welcome more than 3,800 new first-time freshmen, another 3,800 new transfers, 1,600 new graduate students and 135 new credential students. All together, nearly 35,000 of you will pursue your studies at San José State University this year, one of the largest, most diverse, and best prepared classes in our history. As this historic class begins the year, I also am delighted to welcome 65 new tenure track faculty members, as well as our new Vice President for Student Affairs Patrick Day, interim Provost and Senior Vice President for Academic Affairs Dr. Joan Ficke, and Dr. Heather Lattimer, our newly arrived Dean of the Lurie College of Education. As I remarked in my welcome back address yesterday, I anticipate that this will be an important and transformative year for San Jose State. We continue to build our facilities and our programs at an incredible pace to better support our teaching, research, and service missions. I am sure we all are looking forward to the completion and opening of the new Spartan Recreation and Aquatic Center. This state-of-the-art facility will provide a place for you—whether students, faculty, or staff—to recreate, swim, exercise and keep fit. Stay tuned for a grand opening sometime in early April, with membership and other information on its way in the months ahead! We also hope to break ground on our new Interdisciplinary Science Building, the first new academic building in 30 years for SJSU! I look forward to keeping you up to date on all these developments. I hope these activities provide you a taste of what should be an exhilarating year for all of us here at SJSU! Again this year, returning students and members of our faculty and staff are volunteering at three “Ask Me” tables across campus from Aug. 20-24 to help acclimate anyone who might have questions. All students – both new and returning – as well as faculty and staff members are encouraged to stop by a table to learn about your university and all that it offers. I am looking forward to a transformational year as we all work together to chart the future of San José State! I want to hear from you as we continue to grow and learn together. Please do not hesitate to send me an email with your thoughts, questions or concerns. Editor’s note: The following message was emailed to all students, faculty and staff on July 2, 2018. I am pleased to announce that Patrick K. Day will be joining San Jose State as our next vice president of student affairs, effective August 16. Patrick comes to us from the University of the Pacific, where he currently serves as vice president for student life. For those who were unable to attend Patrick’s open forum during his June visit to SJSU, I would like to share more about him. 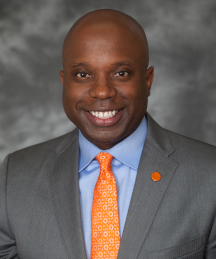 For the past five years, Patrick has served as UOP’s chief student affairs officer, leading 120 staff members in 17 departments and administering a $30 million budget serving students in undergraduate, graduate and professional degree and training programs on three campuses. During his tenure, UOP created a strategic plan for student success to improve educational attainment for all students, constructed a $40 million residence hall, fundraised $2.6 million for student life, and secured a $400,000 grant for a career development initiative. Previously, Patrick served in a series of student affairs roles at campuses large and small, public and private, including the University of Massachusetts, Boston, where he was the chief student affairs officer, Temple University, Johnson C. Smith University, and Texas Tech University. He began his career as a student admission associate at Northwestern University, where he received a bachelor’s in education and social policy. In addition, he holds a master’s in higher education administration from Texas Tech. Throughout his career, Patrick has been extensively involved in campus, community and professional organizations. I encourage you to review his CV to learn more. I would like to take this opportunity to thank our search committee, chaired by Associate Professor of Economics Colleen Haight. I would also like to thank Interim Vice President for Student Affairs Sharon Willey. Under her leadership, the division introduced many new services, including opening a series of student success centers and launching SJSU Cares, lending a hand to students in need of emergency financial, food, housing and medical assistance. Sharon will continue to serve in this capacity until Patrick’s arrival. Please join me in thanking Sharon and welcoming Patrick to campus. Editor’s note: The following message was emailed to all students, faculty and staff on June 20, 2018. I am pleased to announce that Dr. Joan C. Ficke has accepted my invitation to serve as interim provost and senior vice president for academic affairs at San Jose State, effective July 16, 2018. Dr. Ficke brings to San Jose State more than three decades of relevant experience as a professor and higher education leader at Montclair State University (Montclair, New Jersey), which has much in common with San Jose State. Founded as a teacher’s college, Montclair State has grown into a comprehensive multipurpose research institution with three campuses approximately one hour from Manhattan. 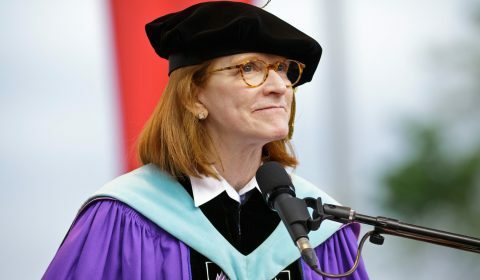 Dr. Ficke most recently served as dean of The Graduate School at Montclair State, where her staff of 20 administered 140 programs at the master’s and doctoral level for 4,000 students. She previously served for more than a decade in various leadership roles, culminating in senior vice provost, where she was responsible for all faculty personnel matters, the university registrar, career services and special sessions. Earlier in her career, Dr. Ficke served as interim dean of students, director of the women’s center, executive director of the New Jersey Business Group on Health, and president of the faculty union. For nearly two decades, Dr. Ficke was a professor in Montclair State’s Department of Public Health and Department of Exercise Science and Physical Education. You will find an extensive list of her scholarly achievements, activities, research and publications on her resume, which we have posted online. She received her bachelor’s from Montclair State, and her master’s and doctoral degrees from New York University. Dr. Ficke has agreed to serve in this interim role while we conduct a national search for a permanent provost and senior vice president for academic affairs. Dr. Ficke will not be a candidate for the permanent position. I also am very pleased to announce that Dr. Melinda Jackson, Chair of the Department of Political Science, has agreed to chair the search committee for our next permanent provost and senior vice president for academic affairs. We will share the full committee roster as soon as we can confirm each member’s ability to serve in this important role. The search officially will launch at the start of the 2018/2019 academic year. Meanwhile, please join me in welcoming Dr. Ficke to San Jose State. 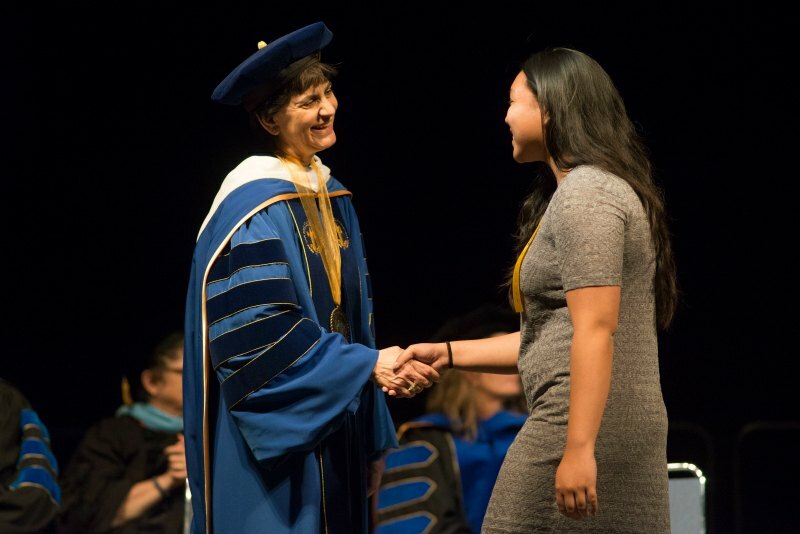 President Mary A. Papazian congratulates students at Honors Convocation on April 20 (photo by Brandon Chew, ’19 Photojournalism). As we head into the final weeks of the semester, I want to begin with some good news for our students: California State University Chancellor Timothy P. White has just announced that there will be no tuition increase in 2018-19. While this is certainly good news for students, we are not out of the woods yet. I encourage all to continue your advocacy with our legislature to ensure that the CSU is a priority and is recommended for full funding in the next fiscal year. Keeping tuition at the current level means our students can focus on pursuing the degrees we offer here at San Jose State as they prepare for success in their chosen fields. California’s commitment to higher education, represented by fully funding the CSU budget request, combined with the professional opportunities our state offers contribute greatly to SJSU placing among the top colleges and universities in the nation, as evidenced by the CollegeNET Social Mobility Index (#4) and the Forbes Best Value Colleges (#55). More on budget in a moment. During these final weeks of the semester, we have a whirlwind of activities and events ahead of us. Students and faculty are preparing for finals and our soon-to-be graduates are full of anticipation for what the future holds. This year we are on track to confer degrees to graduates who are about to embark on a new phase in their Spartan journey as alumni. I hope to see all our graduating students at the commencement ceremony for their college, along with many friends, family members, faculty and staff members, and peers who I know will want to be part of the festivities. As many of you know, Provost and Senior Vice President for Academic Affairs Andy Feinstein will be departing SJSU in June to become president of the University of Northern Colorado. Andy worked within his own division of Academic Affairs to help create and implement many innovative programs and initiatives that brought more than 250 new tenure-track faculty members to San Jose State, elevated research, scholarship and creative activity, and made significant progress with plans for an Interdisciplinary Science Building to be constructed near Duncan Hall. More information about our transition plan will be shared with the university community soon. In the meantime, I hope you all will join me in wishing Provost Feinstein farewell at a reception in his honor from 3 to 5 p.m. May 7 in the Student Union Ballroom. Please be sure to RSVP by May 1. We are making progress on our search for a vice president for Student Affairs. Four candidates are visiting SJSU this week and are meeting with students, faculty and staff in a series of conversations and open forums (see the full schedule online). For those who are unable to attend in person, videos of each forum will be posted to the cabinet-level search page by end of day April 27. I encourage everyone to complete the online feedback forms for each of the candidates by 5 p.m. May 2 to insure we have robust input into the selection of the best candidate for San Jose State. On April 16, Dr. Michael Kaufman was appointed as dean of the College of Science after a comprehensive national search. Michael has more than 20 years of experience at SJSU and has served in multiple leadership roles, most recently as interim dean for the college. I am confident that he will provide enthusiastic and strategic leadership as we continue to make progress on the Interdisciplinary Science Building and other important initiatives within the college. On April 23, Joanne Wright will take on the position of senior associate vice president for University Personnel. Joanne moves into this new position from her current role as senior director, Academic Employee Relations and deputy Title IX coordinator, a position she has held since joining SJSU in 2015. Prior to that, Joanne enjoyed a long career as counsel and an administrator in personnel and employee relations matters in both the public and private sectors. Please join me in congratulating Dr. Kaufman and Ms. Wright on these new roles. One of the most admirable aspects of academia is our tradition of preserving a core set of values through many years and leadership transitions. This applies to San Jose State’s commitment to diversity, and especially our commitment to nurturing a community where everyone feels welcomed, supported and successful. This is, of course, much easier said than done, as recent events at Cal Poly San Luis Obispo remind us. Let me be clear: Such behavior has no place at San Jose State. We don’t have to look too far into the past to remember that we have had our own experiences with poor judgment and intolerant behavior. There has been a great deal of effort to move toward a more inclusive and healthy campus climate since San Jose State concluded its own hate crime task force, and I appreciate the efforts in which so many of you have engaged to bring about meaningful change. All of you have been touched by our Office of Diversity, Equity and Inclusion, a perpetual reminder of the value in making thoughtful and respectful choices in all aspects of campus life, from classrooms and residence halls to offices and events. Even what one of us posts on a personal social media account can reflect on all of us. To our students, I would like to make clear that we are here to support you. We firmly believe your participation in campus life, including Greek Life, will make you a stronger student and a more well-rounded individual. Our Student Involvement office, now in the Diaz Compean Student Union, is staffed with professionals who value your personal growth through many registered student organizations. But remember, membership in these organizations, and our community, is a privilege and a responsibility. I am not afraid to take quick action if such action becomes warranted, although I have every confidence that it will not be necessary here at San Jose State. Should you have any concerns or questions, our Title IX Office is available to assist even if you would like what you share to remain confidential. The campus budget outlook is changing as I write this. When we held our campus budget forum on April 19, Chancellor White was considering a tuition increase for the coming academic year. Less than 24 hours later, we learned that the chancellor decided against a tuition increase, in light of our strong economy and strong expressions of legislative support for the CSU system. This is predicated on progress with the Graduation Initiative and increasing enrollment to meet the needs of our state’s high school and community college graduates. While the state’s budget process continues through June, San Jose State must move forward with its own budget plans with the goal of supporting stable operations in the years to come. For this reason, San Jose State will proceed with its three-year budget planning process, including our decision to apply any available funds to shared priorities such as the Graduation Initiative, student support and campus safety. We are committed to remaining in contact and seeking your input as this situation evolves. Vice President for Administration and Finance Charlie Faas is available to assist with questions. You can reach him at vp.adminfinance@sjsu.edu. As we focus on student success, I am pleased to share we are making steady progress in launching our EAB Student Success Collaborative partnership. Last week, EAB representatives visited campus to meet with Student Affairs, Academic Affairs, IT leaders and advisors in preparation for our initial rollout of new advising tools. Through EAB’s Student Success Management System, we will be better able to predict when students need additional support to stay on track toward graduation and how to communicate with them about resources that can help them. This new tool also will facilitate interactions between various departments and groups that provide advising resources on campus. As we continue our focus on student success, these types of interdivisional collaborations that combine technology solutions and personal interactions will be essential to enhancing student support and student success. Our commitment, as always, is to our students, and last week’s Honors Convocation provided a renewed sense of purpose, mission and pride. On April 20, our Event Center hosted our 56th annual Honors Convocation. Filled to capacity for a rousing recognition of our top students, we honored a record number for academic achievements—4,105 Dean’s Scholars maintained a GPA of 3.65 or higher in two contiguous semesters of the last three while 505 President’s Scholars maintained a 4.0 during the same period. I had the pleasure of saying a few words to the President’s Scholars, a stellar group of undergraduates who have reached a level of excellence through their own individual sacrifice and through the support of their families, friends, our faculty and staff. It was an honor to shake hands with so many students that evening. Read personal stories of some of our 2018 scholars online. Honors Convocation also provides an especially poignant time to celebrate our 2018 Faculty Award Winners. Joining me on stage for the evening’s celebration were our Outstanding Lecturer Deb Nelson, President’s Scholar Carlos Sanchez, Outstanding Professor Peter Beyersdorf and Distinguished Service Award Recipient Roy Okuda. These four professors exemplify the important role all our faculty members play in inspiring our students to dream big and supporting them in achieving those dreams. Thank you to all the faculty in attendance who cheered on our students and to the planning committee who put on another wonderful event. On April 4, I was delighted to attend the Celebration of Research and meet many students and faculty members who are engaged in interesting and impactful research, scholarship and creative activity. When I speak of these endeavors on our campus, I prefer to use the full phrase rather than the campus shorthand of RSCA. Using the entire phrase allows us to educate our community on the breadth of work that is conducted here and the importance of expanding access to these opportunities for faculty to engage with our students. We know that faculty engagement in research, scholarship, and creative activities not only strengthens our faculty but also creates opportunities for students to learn from mentors, empowering them to learn using hands-on techniques. I was especially excited to learn about the topics pursued by our 2018 Undergraduate Research Program Student-Faculty Research Pairs. We have 45 student-faculty pairs who have pursued projects on a host of topics, illustrating the rich variety of pursuits that exists across our entire campus. From adding to our understanding of driverless cars to the representation of minorities in television to climate change, our students and faculty have selected work that is timely and has the potential to make positive change in our community and beyond. During the event, we also honored our 2017 Early Career Investigator Award recipients. Assistant Professor Ehsan Khatami, from the Department of Physics and Astronomy, and Assistant Professor David Schuster, from the Department of Psychology, surely deserve the title. As recent arrivals to our university—Khatami joined us four years ago and Schuster five years ago—they have already made tremendous progress in earning grant funding, publishing their findings and building strong research labs that provide opportunities to engage with students. Our research, scholarship and creative activity take different shapes for different disciplines. Some endeavors are pure discovery, others are applied projects with industry partners. Interacting with everyone the afternoon of the Celebration of Research reminded me of why we must continue to provide support for these important activities. I encourage everyone to review the SJSU Research Foundation 2018 Annual Report to learn more about this $57 million enterprise. As a scholar of English literature, I was especially pleased this month to celebrate San Jose State’s rich legacy of poetry. As some of you may know, we have a long history of creative endeavors. Thank you to professors Annette Nellen and Alan Soldofsky for continuing to highlight the legacy of Edwin Markham, famed alumnus and writer of The Man with the Hoe, and Dr. Henry Meade Bland, a professor who helped to establish in 1867 our very first literary journal, The Acorn, as well as the many accomplished writers who have been part of our university community through the years. After our community gathering outside the Hammer Theatre on April 12, I was pleased to spend the evening in dialogue with Armenian-American poet Peter Balakian as part of the Center for Literary Arts Reading and Conversation series. My husband Dennis and I have known Peter for many years, and it was wonderful to share the stage with a talented writer and dear friend. More than 300 people were in attendance to hear Peter read from his selection of poetry that touches on the experience of the Armenian diaspora. The gravitas of his work clearly shows why he won a Pulitzer Prize for his collection of poetry, Ozone Journal. During the evening, I was pleased to engage with Peter as well as audience members as we explored the importance of culture and what happens to the culture of people who are displaced. It is an especially timely topic as the United Nations recently has reported that 255 million people around the world are migrating annually, often to escape military conflicts, political or social oppression, or to increase their economic opportunities. As a university that is committed to supporting a variety of students, faculty and staff members, including those who are immigrants or the children of immigrants, the conversation with Peter was a reminder of the perseverance of many in our community. My appreciation to Cathleen Miller, the director of the Center for Literary Arts, and her staff and students for coordinating such a wonderful event. Six years ago, the Dublin-San Jose Sister City committee developed the first master’s degree scholarship exchange. The most recent recipients include Aidan Smyth, who is studying electrical engineering while living in SJSU’s International House and interning at Cypress Semiconductor, and Gurpeet Pannu, a music student who is spending a semester living and studying at Dublin City University. We are fortunate to be able to expand access to international experiences for our local students with support from generous donors and to offer international students exemplary opportunities to study at our university. Dr. Laurie Drabble, a professor in the School of Social Work in the College of Applied Sciences and Arts, has been selected to serve as a member of the National Institutes of Health’s Center for Scientific Review Community Influences on Health Behavior Study Section. She will begin her term on July 1 and serve through June 2022. Through her service, Dr. Drabble will have the opportunity to contribute to the national biomedical research effort. San Jose State is honored to have two faculty members appointed as U.S. Fulbright scholars. Dr. Cathleen Miller, a professor of English and director of the Center for Literary Arts, will serve as the first distinguished chair of humanities at the University of Manchester in the United Kingdom, where she will teach creative non-fiction and continue research into the phenomenon of women’s migration throughout the world. Dr. Victoria Rue, a lecturer in the Department of Humanities, has been awarded a United States Fulbright Scholar appointment to the Palestinian Territories (West Bank). Her work in the field of comparative religions is exemplary and this appointment serves as a testament to her leadership in the broader field of humanities. Congratulations to our women’s gymnastics team, which has won the Mountain Pacific Sports Federation championship for the second year in a row. Senior Kaitlin Won lived up to her name winning the all-around individual championship and sophomore Chelsey Andrada finished first in the vault. Several spring sports teams recently competed in and other squads are nearing their respective conference championships. Sophomore Sean Yu of the men’s golf team finished third at the 2018 Mountain West Championship in Bremerton, Wash., the highest individual finish by a Spartan since we joined the conference in 2013. Big things continue happening at South Campus. Last December, we had a ribbon-cutting ceremony for our new outdoor tennis complex. On Friday afternoon, April 27, we will have a ribbon-cutting ceremony for our new softball field right next to the Spartan Tennis Complex. Diverse Issues in Higher Education recently recognized 41 Spartan student-athletes of color with the publication’s annual Arthur Ashe, Jr., Sports Scholar Awards. San Jose State was No. 1 nationally among colleges and universities for the most student-athletes receiving this honor in 2018. And, finally, congratulations to Dr. Harry Edwards (Class of ’64, ’16 Honorary Doctorate), who will be inducted into the College Sports Information Directors of America (CoSIDA) Academic All-America Hall of Fame at the end of June. This prestigious honor recognizes student-athletes that excelled academically and athletically, achieved success in one’s professional career and are committed to philanthropic causes. Dr. Edwards is joining San Jose State alumna and 1980 U.S. Olympics team fencer Dr. Stacey Johnson (Class of ’80), a 2017 inductee, in this Hall of Fame that now has 150 distinguished honorees from among the millions of student-athletes that participated in intercollegiate athletics through the years. Animation Career Review 2018 Graphic Design School rankings listed our graphic design program in the top 7 percent nationally and the top 5 percent among public universities. This high ranking is a nod to the strong reputation of our program that allows students to learn the foundational aspects of design while they build a versatile portfolio that has landed our graduates positions at top firms, including Pixar Animation Studies and Google, among others. This Friday, SJSU’s production of In the Heights opens at the Hammer Theatre. The award-winning show from Lin-Manuel Miranda is a collaboration between the Department of Film and Theatre and the School of Music and Dance. Watch our students perform in this story of the American Dream set in a Hispanic-American neighborhood in New York City, through May 6. Tickets are on sale now. As we head into the final month of our semester, the pace of events and activities promises to stay just as energetic as recent weeks. Tonight, CommUniverCity will celebrate 13 years of university, city and community engagement. Tickets are free with registration online. Stop by the Duncan Hall Breezeway from 10 a.m. to 1 p.m. April 27 to see the accomplishments of many of our students at the College of Science Student Research Day. On April 28, the Native American Student Organization will host its first ever Community Powwow. And we will, of course, have many more opportunities to celebrate the achievements of our students as we close out the semester, starting with the Braven Live Your Legacy event on May 16. Please also remember that while the end of the year is a joyful time, it can also be a stressful time. Counseling and Psychological Services and the Behavioral Intervention Team are available to support students who may need services during these final weeks of the semester. Faculty and staff, please refer students who may be in need of support to these resources. In addition, counseling is available at no cost to all faculty and staff members through our employee assistance program. In closing, I especially want to encourage everyone to attend the Strategic Planning Steering Committee’s final university-wide event of the year, from 10 to 11 a.m. May 7, in the Diaz Compean Student Union Ballroom. I hope you will join me as our task force chairs share the latest iteration of desired outcomes and action items that will form the foundation of our next strategic plan. Please RSVP for the event online. Let’s work together to finish out the semester on a strong note! Editor’s note: The following message was emailed to all students, faculty and staff on April 4, 2018. Today marks the 50th anniversary of the assassination of Dr. Martin Luther King, Jr. No single quote, photo or film of Dr. King can encapsulate all he accomplished in the name of human rights. A non-violent journey he began as a young man in service to his congregation, community and home state carried messages that resonated deeply across our nation, around the world and through time. Indeed, he was a Nobel Peace Prize recipient. I am reminded of this, and I believe all of us are, when we cross our campus and pass by the monument our students built in memory of our alumni and Olympians John Carlos and Tommie Smith, who took a stand for human rights at the 1968 Olympics, six months after Dr. King’s assassination. In doing so, they became part of the history of a tumultuous year that also saw the assassination of Senator Robert Kennedy. The Smith/Carlos sculpture, and today’s anniversary, reminds us Dr. King’s journey continues. It is my hope that each of you will take a moment to reflect on this day’s significance. Dr. King’s last speech, in support of sanitation workers seeking equal pay and work conditions, is well remembered for its reference to work that would outlast him. Local school students, community members, and our campus community will gather today at our library, named in Dr. King’s honor, to mark his passing. Beginning at approximately 3:50 p.m., 50 chimes will ring, ending close to 4:01 p.m. PST, the moment when Dr. King was struck down outside the Lorraine Motel in Memphis, Tennessee. President Papazian in conversation with Condoleezza Rice, Secretary of State, 2005-2009 (Photo: James Tensuan, ’15 Photojournalism). For many around the world, spring’s arrival is a time of celebration. I hope all of our students and faculty members are spending spring break with friends and family, or supporting an important cause through participating in an alternative spring break program. As I write this message, I can see our beautiful campus. The sun has returned, the sidewalks are quiet, and I would like to take a moment to share a few thoughts. I begin on a rather somber note to acknowledge the deep and personal loss felt by many on our campus as a result of recent events in Yountville. Among the four individuals who lost their lives on March 9 was Dr. Jennifer Gonzales. Jennifer was a Veterans Administration clinical psychologist who worked with San Jose State from May 2015 to September 2016. She provided services to military and student veterans, and helped launch our Veterans Resource Center. In fact, Jennifer was here recently to celebrate the center’s grand opening in the Diaz Compean Student Union. Jennifer grew up in the South Bay and although she was not a San Jose State graduate or employee, she responded to our call for assistance with veterans’ services at SJSU. Her work here was funded by a grant program called VITAL, or Veterans Integration to Academic Leadership, which supports military veterans pursuing college degrees. Her many specific contributions include assistance creating a VA Campus Toolkit and an online course focused on student veterans. After Jennifer completed her work at San Jose State, she accepted a new role, which took her to the San Francisco VA and the Pathway Home program located on the grounds of the Yountville veterans home. In the past year, she was married, and she and her husband T.J. Shushereba were expecting their first child. Please join me in sending your thoughts to all who knew and loved her. It is not lost on me that the recent gun violence, like that which took Jennifer’s life, is top of mind in our community as well. Campus safety has never been more complex. As a university president, and as a mother of two college-age daughters, there is not a moment in time when I am not at some level thinking about this topic, if not discussing it with all of you and our campus leadership team. Let me start with some news. As some of you know, Chief of Police Peter Decena will step down March 30 to become chief of the Los Gatos-Monte Sereno Police Department. Please join me in thanking Chief Decena for eight years of service to the San Jose State community. Chief Decena’s deep commitment to our campus is rooted in his own experience pursuing bachelor’s and master’s degrees here. He began his policing career with us in 1980, left to join the San Jose Police Department, and then returned to serve as our chief. We soon will commence a national search for a new chief. An interim chief will be appointed shortly. In the context of campus safety, I encourage all of you to be our eyes and ears. “See something, say something” works, as evidenced by several recent incidents, and on a campus as large and complex as ours, we most certainly need to engage all of you. Should you come across any information that causes you to question campus safety, please check first with the University Police Department, which is available 24-7 at 408-924-2222. UPD immediately will investigate and validate information and then take appropriate action as needed, which includes informing all campus community members. In addition, resources are available on a confidential basis to all impacted by sexual misconduct and violence, whether or not those seeking assistance choose to file a police report. For more information, please contact the San Jose State University Title IX Office at (408) 924-7290. Our Title IX office takes every report seriously, and will respond accordingly. A final note: All students, faculty and staff are invited to take part in our bi-annual safety walks. Help spot safety concerns while touring campus with Vice President for Administration and Finance Charlie Faas, University Police Department representatives, Facilities Development and Operations personnel, and all interested community members. The next safety walk is scheduled for 7 to 9 p.m. April 2. Meet outside the FD&O building at South Ninth and East San Fernando streets. As Provost Feinstein shared last week, we have appointed a new dean for the Connie L. Lurie College of Education. Dr. Heather Lattimer will join us from the University of San Diego, where she is a professor of education and the executive director of the Jacobs Institute for Innovation in Education. She has a proven record of collaborating with local school districts, community partners and industry leaders, and in developing new programs. She will join us August 1. In addition to her time spent in higher education, Dr. Lattimer has nearly 10 years of experience teaching multiple subjects at the middle school and high school levels. Indeed, she began her teaching career right here in San Jose! The professional beliefs and practices she expressed during the search process – a commitment to diversity, dedication to ensuring student success, and a passion for preparing educators who prioritize equity and excellence – connect with the college’s mission and our university goals. I look forward to working with Dr. Lattimer when she joins us this summer and hope you will offer her a warm Spartan welcome in August. I also would like to express my gratitude to Dr. Paul Cascella, who has served as interim dean for the past 18 months and will continue to lead the college through the end of July. There are several more searches under way. We now are accepting applications for vice president for Student Affairs. Candidates for dean of the College of Science and the senior associate vice president for University Personnel visited campus in recent weeks. Expect to hear more on these positions soon. 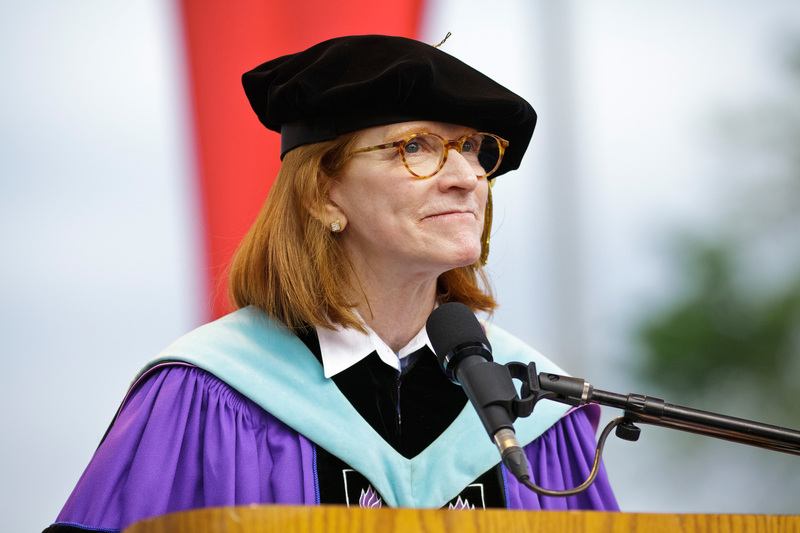 This past week, we lost a remarkable alumna, Nancy McFadden, ’84 Political Science. She passed away on March 22. I was not here when San Jose State invited her to deliver the Commencement address in May 2014, but it is clear to me that she was the perfect candidate to speak at the university-wide ceremony held in Spartan Stadium, where she received an honorary doctorate. Nancy dedicated her entire career to public service, including senior leadership positions in the administrations of both President Bill Clinton and Governor Jerry Brown. Nancy was selfless and always demonstrated, even when the pressure was on in Washington, D.C., and Sacramento, that our most precious role in life is mentoring those who follow us. This is a trait common in SJSU alumni, I have come to learn in my first two years here. I encourage all of you to read the full story. Please join me in keeping Nancy’s loved ones in your thoughts. Like Nancy, the students who spoke at our first-ever Student Success Symposium on March 15 have embraced challenges and flourished. As I shared at the event, when we discuss student success, we often focus on graduation rates, the equity gap and other data points that can easily be measured. But behind each number and data point, we have students with dreams and aspirations. More than 230 faculty, staff and students attended this inaugural event to hear from innovative national leaders in higher education and listen to our current students who shared their unique educational journeys. Jabriel White is a transfer student from Riverside who admitted SJSU wasn’t his first-choice school. But now in his second semester, he said San Jose State is a perfect fit. Connecting with student organizations has made him feel at home. Puneet Sanghera started as a pre-nursing student and then took a semester off to care for an ailing family member. She returned to enroll in a new major and hit her stride working in a neurophysiology research lab on campus. Puneet graduates this spring and has been accepted into a graduate program at San Francisco State University. Asya Evelyn is a sophomore political science major who has her sights set on affecting positive change now and after she graduates. She already is involved in promoting the kind of social justice for which our university is known through her work with the MOSAIC Cross Cultural Center. And Jose Jaime Esquivel Patricio is working hard to earn his aerospace engineering degree as he promotes social change as the president of Student Advocates for Higher Education. While engaged in outreach to local high schools and prospective SJSU students, he completed a summer research program at Stanford last year. These students — like all the students we serve — have remarkable stories that have led them to San Jose State. It is up to us to help them succeed through graduation and beyond. I encourage you to visit the Student Success Website to find ways to get involved in our efforts. 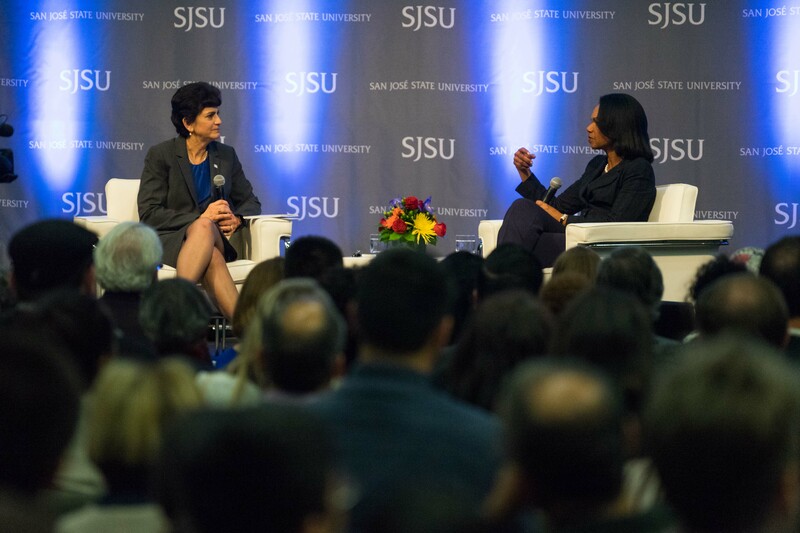 It was an honor to welcome Condoleezza Rice, Secretary of State (2005-2009), to SJSU on the evening of March 22. The event organizers and I are especially appreciative that Dr. Rice arrived early and was able to spend 30 minutes speaking with a small group of business and economics students. Their questions and her responses were enlightening! An especially memorable moment was when she recalled why she switched majors from music to political science while she was in college at the University of Denver. “Find something you are passionate about, and try something hard,” she said. As Secretary Rice described her own journey, she remarked on how as a college student at the University of Denver, she was particularly inspired by a faculty member who loved his subject. His name was Josef Korbel, and in a stroke of serendipity, he was the father of Madeleine Albright, who also served as Secretary of State (1997-2001). Perhaps most memorable for the students in the crowd was Sec. Rice’s advice on writing papers. “At some point, you have to ask yourself, ‘What is my greatest weakness?’” she said. She admitted hers was procrastinating. She urged students to finish required reading early to give themselves time to think it over, and to create an old-fashioned outline so that the writing took care of itself. Dr. Rice was the first in our new speaker series, “Insights,” which promises to bring to SJSU a variety of perspectives on economics, business and international affairs. I would like to express my gratitude to the Valley Foundation for underwriting this series and to all who helped with preparations for Dr. Rice’s visit. We were fortunate to have more than a dozen distinguished guests, some who were trailblazers of the early Title IX era, and others who are active today as executives, attorneys, advocates, coaches and TV commentators. In the larger context of the #MeToo movement sweeping our country, the timing of this conversation could not have been better. Thank you to all who helped orchestrate the day’s activities. As a woman university president at a time when only 23 percent of college and university presidents are female (the California State University is exceptional, with more than half of our campus presidents being women), I had the extraordinary experience of listening to our panelists and experiencing their words and emotions while sitting between my two young adult daughters, something I will never forget. The event fostered discussions with my family about the challenges we do and will face. And professionally, I think often of the issues we explored at the town hall, especially in the context of the tech culture of our region. I have always felt a personal responsibility to pay it back and create pathways of true opportunity for women and girls, as well as for all members of underrepresented communities. Speaking of tech culture, the Charles W. Davidson College of Engineering hosted the 2018 Silicon Valley Women in Engineering Conference on March 17. The conference is in its fourth year and is a truly remarkable collaboration involving our university, community and tech companies, with the goal of diversifying the engineering workforce. Women engineering students from SJSU and local community colleges gathered in the Diaz Compean Student Union to learn from women and men who have broken barriers in every engineering discipline, including executives from leading companies such as Google, Intel, IBM and more. As Dean Sheryl Ehrman said, news stories nationwide point toward a new empowerment in our pursuit of gender equity. Our appreciation goes out to the sponsors who made the event possible, including the Mark and Carolyn Guidry Foundation, which has supported the conference since 2015. As we recognize the important connection between business and higher education, it was a true pleasure to participate in a panel discussion and host a dinner March 14 and 15 with the Business-Higher Education Forum. Based in Washington, D.C., this national organization seeks to foster partnerships between higher education and the corporate community in support of workforce development. The dinner at our own Hammer Theater was followed the next day by a panel, at Amazon Web Services in East Palo Alto, focused on cybersecurity, artificial intelligence, automation, cloud and digital skills gaps. I was pleased to share information about existing and potential collaborative efforts to provide our students with the academic and practical skills needed to further their careers and support the region. This is at the heart of what we do as a university, and an area of focus where I see tremendous opportunity for growth. Conversations like this one help the tech and higher education worlds better understand the challenges each face. The setting for the dinner the opening night was the practice hall on the fourth floor of the Hammer Theatre. It was an appropriate location given it is reflective of San Jose State’s partnership with the City of San Jose, which enables us to operate the Hammer for the benefit of all who live, work and enjoy the arts in the South Bay. Among those in attendance were former CSU Board Chair Bob Linscheid, Chancellor Timothy White, Cal Poly San Luis Obispo President Jeffrey Armstrong and CSU Maritime Academy President Thomas Cropper. Attending from San Jose State were Vice President for Information Technology Bob Lim, College of Science Dean Michael Kaufman, Lucas College and Graduate School of Business Dean Dan Moshavi, and Charles W. Davidson College of Engineering Associate Dean of Extended Studies Jacob Tsao. It always is impressive to see positive media coverage of future and current San Jose State students. My thanks to Susan Arias, of the SJSU MESA Schools Program within the College of Science, for sending me this link to a story about Campbell Middle School. What a thrill to see so many girls and boys excited about their achievements at a recent event here at SJSU. MESA is a national program that provides middle and high school students with hands-on, real-world opportunities to explore science, technology, engineering, and math. On the topic of media coverage, SJSU’s own Spartan Daily newspaper received two second place awards at the National College Journalism Convention this month. The student journalists received second place in the Best Newspaper category and second for Best Special Issue in a competition that included nearly 100 university and college papers. And in true Spartan spirit, the winning special issue edition, entitled “Divided/United,” focuses on hot topics such as political partisanship, immigration policy and more. The Spartan Daily, Update News and Spear Magazine also won 13 awards in a statewide competition. Congratulations to our student journalists and their faculty advisors! In other good news, our School of Music and Dance’s University Dance Theater students were invited to perform their work, Exoskeleton, at the American College Dance Association Gala Concert this month in Tempe, Arizona. The performance earned them an invitation to attend a national conference and to perform their work at the Kennedy Center. Only two dozen works were selected for this honor from nearly 700 that were submitted. Our student-athletes also have provided reasons for us to celebrate this month. Senior Madison Aurin was named USA Softball Collegiate National Player of the Week for games ending the week of March 18. In four games, all Spartan wins, Aurin hit three home runs, was the winning pitcher in two Mountain West victories over San Diego State and was credited with a pitcher’s save in a non-conference victory over Fairleigh Dickinson to earn the national honor. We also received word that 38 Spartans were named to the Mountain West’s All-Academic team for the fall sports of football, women’s volleyball, men’s cross country, women’s cross country and women’s soccer. Next month, our men’s golf team will continue with tradition as it hosts the 72nd annual Western Intercollegiate, the longest-running men’s college golf tournament west of the Mississippi, at the Pasatiempo Golf Course in Santa Cruz, April 7 and 8. We have many more upcoming activities planned for April, including the SJSU Celebration of Research April 4, Faculty Service Recognition and Awards Luncheon April 5, distinguished American pianist John Nakamatsu in concert April 7, Legacy of Poetry Day April 12, and Honors Convocation April 20, when we will recognize a record 4,600 students for their academic achievements. Three campus organizations will celebrate significant milestones: MOSAIC Cross Cultural Center will mark its 20th anniversary on April 11, CommUniverCity will mark its 13th anniversary on April 13, and the Associated Students of SJSU will mark its 120th anniversary on April 27. The 50th anniversary of Dr. Martin Luther King, Jr.’s death is April 4. University and community members will gather at our library, named in his memory, to ring chimes 50 times in King’s honor. The chimes will begin at 3:50 p.m., and end at 4:01 p.m. Pacific Time, the exact date and time in 1968 when King was struck at the Lorraine Hotel in Memphis, Tenn. I would like to thank Professor of Journalism and Mass Communications Michael Cheers for helping to organize this event. An SJSU Budget Forum is planned for 11 a.m. to noon April 19 in King 225/229. Vice President for Administration and Finance Charlie Faas will describe our plans for the coming year. Provost Andy Feinstein and I will be available to answer questions. Governor Brown’s budget proposal provides less to the California State University system than expected. Many CSU leaders including me are doing all we can to explain our needs to legislators. Meanwhile, we will plan thoughtfully, with a firm commitment to our priorities, including instruction, student support, campus safety, and the Strategic Plan. Our campus is indeed quiet now, with most faculty members and students away for spring break. In addition, on Friday, we will close in observance of Cesar Chavez Day, which marks the birth and legacy of the human rights leader, memorialized with the beautiful arch outside the Diaz Compean Student Union. Rest now because April promises to be another busy month! 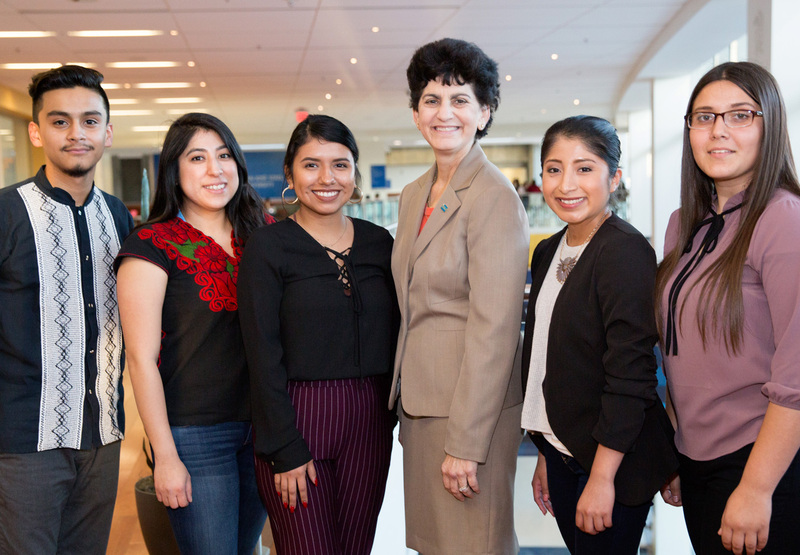 President Mary A. Papazian, third from the right, connects with Chicanx/Latinx Student Success Center interns Erick Macias-Chavez, Ana Ferretiz, Paola Quintanilla, Flor Sario and Janely Cerda at a spring welcome event February 5 (photo by David Schmitz). It is hard to believe we are nearing the end of February—the beginning of this semester has just flown by. There is much to do in terms of sharing our story and advocating for our university, while working to connect with many of you on campus. I had the pleasure of engaging with students at the Chicanx/Latinx Student Success Center Spring Welcome February 5, interacting with university stakeholders at the Strategic Planning Presentation and Community Conversation February 9, and seeing many of you at other events earlier this year. Before we get any further into this term, I would like to share recent news, updates and notes on upcoming events. First, I am sure campus safety is on all of our minds in light of recent events in Florida. A public university like ours is defined to a great extent by a sense of trust. We open our doors and our hearts to one another to create a place that is safe—physically, emotionally and intellectually—so that we may share and grow as individuals and as a community. But this distinction can make us, as we see with each incident on our campus or elsewhere, quite vulnerable. I most certainly understand that it is the responsibility of campus leaders to do all we can to keep you safe. We are fortunate to have the University Police Department and its more than 25 sworn officers serving San Jose State. UPD recently installed, throughout campus, some of the most advanced security cameras available. Using this technology, our officers were able quickly to find and arrest an alleged robbery suspect in January. The Behavioral Intervention Team is another important resource. This collaborative team seeks to identify and assist individuals who may pose a danger to themselves or others. The team very intentionally includes members from all parts of campus to make it clear that we are seeking input and assistance from everyone. In addition to all of these efforts, we always will need your help. We need your eyes and ears, your quick thinking and your action. As I mentioned in my February 15 message to campus, we want to hear from you should you ever become fearful that someone in our community may hurt themselves or others. Similarly, let us know should you ever become concerned about something you see online (for example, something violent posted on social media). The Red Folder reference guide is an icon on the desktop of most university computers and is the best source of information on who to call depending on the situation at hand. If the concern is immediate or you feel a threat or crime is imminent, call UPD at 408-924-2222 or dial 911 from a campus phone. While I have much good news to share this month, including the momentous opening of new student centers, upcoming events with elite visitors to our university, and updates on generous gifts that support our programs, I also have some sad news. In late January, we lost a devoted professor, Dr. Kate Sullivan, who passed away due to complications from a heart attack. Kate helped to found the Department of Hospitality Management and taught at San Jose State for nearly 30 years. Our condolences are with her son, family members, colleagues and students. A Celebration of Life will be held at 3 p.m. March 5 in the Diaz Compean Student Union Theater. There will be a short program to remember her followed by a reception. The campus community is invited. Kate was a dedicated teacher who was admired by her students, and she mentored many graduates as they launched their hospitality and tourism careers, always willing to provide a positive reference with her many industry contacts. Kate’s legacy includes her work to initiate hospitality programs overseas in Dubai and Vietnam in order to provide our students a global experience. I was able to see Kate interact with her students when my husband Dennis and I attended an event hosted by two of her classes. The biannual Beers Around the World Tradeshow that Kate developed was a partnership between her beer appreciation and her conference, convention and event planning classes. Kate created the concept to give students real-world experience, in the context of a beverage tasting event. Although students were in charge, she was always there, with a smile for everyone in the room. February is Black History Month, and we have had a full slate of activities that celebrate the diversity of our students while acknowledging the challenges we still face. Enlightening visitors included author Natalie Baszile, entertainer W. Kamau Bell and a group of student photographers from New York. I encourage all of you to visit the Dr. Martin Luther King, Jr. Library’s Jennifer and Philip DiNapoli Gallery to view “Harlem Reimagined.” On display through the end of March, these remarkable photos are the work of students and alumni from San Jose State and three San Jose and New York high schools, brought together by SJSU Professor of Journalism and Mass Communications Michael Cheers. These young photographers followed in the footsteps of famed photographer James Van Der Zee, who leveraged his skills and vantage point within the Harlem community more than a century ago to capture the community’s rich cultural life. The group focused on changes that are underway today in Harlem, as a new generation of residents settles in, bringing gentrification to parks and streets bearing the names of black luminaries such as Harriet Tubman, Duke Ellington and Dr. King. In more ways than one, the project came full circle when the students from New York traveled to San Jose for the exhibit’s opening. I had the pleasure of attending the event and meeting many of the students and instructors who were involved in this unique project. Having walked these same streets myself while I lived and worked on the East Coast, I was genuinely inspired by the images, which are posted without credits to emphasize that their work was a collaborative effort. Speaking of collaborative efforts, we are well on our way to having a new strategic plan to guide our university through the next 10 years. As I said when we started this journey together at our kick-off event in September, whatever we spend our days doing—teaching, managing, coaching, building, communicating, serving—the future of our university depends on our collective openness to dreaming. And planning. On February 9, the Strategic Planning Steering Committee presented the results of our collective dreaming in the form of the five draft goals. I appreciate all the students, staff, faculty, alumni, and community members who shared their hopes for the future of our university, and who were candid about the challenges we face. We heard many voices at our campus and community conversations last fall that helped us to define areas of focus that will allow us to grow as a world-class public university while remaining relevant and impactful in our community. Thank you to the Strategic Planning Steering Committee co-chairs Provost and Senior Vice President for Academic Affairs Andy Feinstein and Stefan Frazier, chair of the Academic Senate, and the rest of the committee members for their efforts in designing an inclusive process. The work continues this spring, with steering committee members leading task forces that include students, staff, faculty, administrators and community members, as well as representatives from across our divisions. The task forces will develop action items that will move forward each of our draft goals: Educate for Engagement and Innovation; Academic Excellence and Leadership; Thriving Quality of Life; Connect, Engage, Contribute; and Campus Development and Sustainability. At the end of this semester, the Strategic Planning Steering Committee will be ready to present a plan for us to evaluate. I encourage all of you to learn more and provide input online. While our Strategic Plan will encompass many factors, there is one in particular that is of great interest to our elected officials, and that is workforce preparation. I was one of four campus presidents recently invited by the California State University Office of Advocacy and State Relations to participate in a luncheon with several key state senators, and then to make a presentation to legislative staff members in the Capitol. I was asked to focus my presentation on engineering and healthcare, both major drivers of the California economy. In our roundtable discussion and the presentation to legislative staff, I was pleased to share statistics showing our impact on the region and throughout California and to highlight many innovative programs and partnerships developed by faculty members with industry connections in emerging fields of study. These programs include our Microscale Process Engineering Laboratory, where students are learning to design, among other things, tiny devices that could be implanted inside the body to improve health outcomes, and our doctorate of nursing practice, through which we provide professional development opportunities for clinicians such as alumna Mercy Egbujor, who delivers healthcare to San Jose’s homeless. The presentation was well received, and I would like to thank the Charles W. Davidson College of Engineering and the College of Applied Sciences and the Arts for their help developing supporting materials. Many legislative staff members were intrigued and wanted to learn more about how to support student success and engagement. Student success extends well beyond the day our students graduate with their degrees, so I am always pleased to connect with our alumni. I recently attended a luncheon with the Saratoga Rotary Club. It was such a warm and welcoming group! Although I delivered formal remarks, it was not long before we were simply talking about the many connections between San Jose State and this group of civic leaders. Many attended SJSU, but they were especially proud to tell me about one outstanding alumnus. Are you familiar with the story of Benny Pierce? Raised in Los Gatos, he attended college and was a quarterback at San Jose State. His teammates included a name you might recognize, legendary 49ers Coach Bill Walsh. Pierce went on to a very long career teaching and serving as Saratoga High School’s head football coach, leading the team through 31 winning seasons. Today, the high school’s football field bears his name. But what really caught my attention was how Mr. Pierce achieved so many victories. As I later learned while reading a profile in the school paper, he stressed that every single player, even those on the practice squad, contributed to victories. I hear this time and again from great coaches: teamwork leads to lasting success. Planning to Attend the Student Success Symposium? Speaking of teamwork, I encourage you to attend our inaugural Student Success Symposium March 15, from 8 a.m. to 3 p.m., in the Diaz Compean Student Union Ballroom. The day will feature a strong line up of national educational leaders who will discuss best practices and innovative ways to increase graduation rates, close the equity gap, and provide an excellent educational experience for all students. Please RSVP online by March 9. Confirmed guest speakers include UCLA Professor of Education Sylvia Hurtado, who has been involved with the Higher Education Research Institute; George D. Kuh, the creator of the National Survey of Student Engagement and a promoter of high-impact practices; and Timothy Renick, vice provost and vice president for Enrollment Management and Student Success at Georgia State University, which has made great progress with its equity gap. These speakers will provide new perspectives on supporting students that I hope will help us in creating action items to achieve our own goals. I also am pleased to share that we have made one momentous stride in the realm of student success—we opened three new student centers, and all have terrific new leaders. On February 14, I joined a reception celebrating these appointments. Lilly Pinedo Gangai has already planned many activities this spring for the Chicanx/Latinx Student Success Center. She has 12 years of experience in higher education and most recently worked as an academic advisor in our Academic Advising and Retention Services Office. Paula Powell has nearly 21 years of experience and was the founding director of the University of California, Santa Cruz African-American Student Life Resource Center. As the newly appointed director of our African American/Black Student Success Center, she is committed to student achievement and inclusion. Ana Navarrete Avina joins the UndocuSpartan Resource Center from the College of Humanities and the Arts Student Success Center, where she was an academic advisor. She is a passionate advocate for immigrant rights and will serve our undocumented students well. These new centers are made possible in part by the foresight and generosity of those who see our promise. Last February, we announced that South Bay philanthropist Lupe Diaz Compean had made a $15 million gift commitment to the Student Union. In August, we announced that business leaders Gloria and Michael Chiang had made a $2.5 million gift commitment to the Lucas College and Graduate School of Business. Then, on February 7, we announced that alumni Larry and Dierdre Solari have made a $5 million gift commitment to support football personnel and facilities. I have had the pleasure of meeting the Solaris, and I was struck by their appreciation for what athletics brings to young lives. Embrace. That’s a strong word, and it is in reference to the entire university. Make no mistake about this; while these gifts fund specific needs, they also serve as a reminder of San Jose State’s tremendous impact. And they are a call to action to our many alumni and friends to invest in our university so that we can continue to fulfill our mission as an innovative, student centered, transformational institution that is making a difference. Another recent gift to the university is funding a new speaker series. Underwritten by the Valley Foundation, the Insights series will include a variety of perspectives on economics, business and international affairs. Our first event will feature Condoleezza Rice, Secretary of State (2005-2009). Students (with Tower ID) may claim a free ticket at the Event Center Box Office. Tickets for faculty, staff, alumni and community members are available via Ticketmaster. We also are fortunate this spring to be piloting a new mentor program for student-athletes on the Spartan Women’s Basketball team. “Women of Excellence” pairs each player with a mentor for one-on-one interactions off the court. I had the pleasure of meeting some of these mentors on February 10 at the Spartan game against Colorado State University. These mentors truly excel in their fields and areas of expertise, and they include leaders from our community and our university. I know they will inspire our student-athletes to find their own path to greatness beyond basketball, and I hope this connection will motivate our students to affect positive changes in their communities after graduation. I look forward to watching the relationship between the players and mentors grow this semester. I appreciate the work Athletics has done to create this program, including Women’s Basketball Head Coach Jamie Craighead and Athletics Director Marie Tuite. Thank you as well to those who are serving as mentors this season. We had a terrific turnout of Spartans for our Football Signing Celebration in the Diaz Compean Student Union on February 7. The ballroom was buzzing as Coach Brennan and his staff described the young men joining our football program in 2018. Everything you want to know is available here. Congratulations to seniors Cambree Harbaugh, the 2018 Mountain West champion in the women’s indoor long jump, and Nicole Iloanya, the second-place finisher in the women’s triple jump and new school record holder in the event. When we started the women’s track and field program in 2013, Cambree and Nicole were two of our first three scholarship student-athletes in the sport! Our women’s swimming and diving team is sending eight swimmers and three divers to post-season competition in early March. At the Mountain West Championships, senior Colleen Humel was second in the 200 backstroke and Junior Brenna Bushey was second in the 100 butterfly. And, finally, junior Ryan Welage was named to the College Sports Information Directors of America Academic All-District VIII team as one of the top five men’s basketball student-athletes in eight Western states and all of Canada this season. Ryan is a kinesiology major, 2017 SJSU Dean’s Scholar honoree and among the top-100 NCAA Division I players in scoring average. Ryan had a 4.0 GPA last fall. As you can see, February has been a busy month and the rest of the semester promises to be just as full of activities and opportunities. I hope to see you at our upcoming events and I look forward to continuing our work together, providing excellent educational experiences for all of our students. Happy 2018! I hope you enjoyed the holidays with family and friends. After the quiet weeks of winter break, I am delighted to see the return of faculty members and students today. Welcome back! I want to extend a heartfelt greeting to our 900 new undergraduate transfer, graduate and international students and credential candidates who begin their SJSU careers this week. Thank you to the students and members of our faculty and staff who are volunteering at “Ask Me” tables across campus. I encourage new and returning students—and faculty and staff members—to stop by to learn something new about the university. Let’s make the most of 2018! Thanksgiving—a uniquely American tradition—affords us the opportunity briefly to pause and reflect on the many things in our lives for which we are grateful. I continue to be grateful for the opportunity to lead a venerated university, its remarkable students and dedicated faculty and staff members; for my own family and dear friends; and for an engaged, supportive regional community that is eager to see San Jose State fulfill its enormous potential. This month’s blog reports on several strategic initiatives and celebrates the achievements and contributions of students, faculty and staff members, and friends of our university. I want to begin with some words about the recent passing of Don Lucas ’57 Marketing, a dedicated Spartan for whom there simply are not adequate superlatives. Don passed away on October 30 at age 83. A highly successful owner of retail automobile dealerships and the former chair and a long-time member of the Tower Foundation board of directors, Don and his wife Sally have been extraordinarily generous with their time and resources. Their $10 million gift in 2006 put SJSU “on the map” from a philanthropic standpoint; at the time, it was the single largest private gift ever received by SJSU. In recognition, the Lucas College and Graduate School of Business bears their name. In addition to supporting many SJSU academic and athletic programs, the Lucas’s also have generously supported other Silicon Valley causes, two of which bear their name: the Lucas Artist Residency Program and Lucas Fellows at Montalvo. The true impact of their generosity simply is incalculable. I have been grateful for the opportunity to get to know Don and Sally during my initial 17 months at SJSU. My personal impression—clearly shared by others—is that Don epitomized what it means to be a gentleman. Quiet, gracious—often unassuming—he neither sought credit nor attention, preferring to let his actions speak for themselves. Most notably, Don saw himself in our students. Like so many others, he and Sally financially supported themselves during college through hard work; they launched their first car sales business out of an apartment garage. The Lucas Dealership Group eventually became one of America’s 25 largest automobile companies. In a 2006 Washington Square magazine profile, Don and Sally each expressed gratitude for the role that their SJSU experiences played in their professional and personal lives. Both cast their choice to give so generously to SJSU out of a desire to spur others to help the university fulfill its potential. “All they need is support from alumni who care,” Don said. Don Lucas deeply cared for his alma mater. My heartfelt thoughts are with Sally, their two sons, extended family members and friends. Ed Mosher ’52 Drama, announced last month that he is closing the last of his venerable men’s clothing shops. Aptly called a “downtown institution” by Mercury News columnist Sal Pizarro, Ed opened his first store in 1955. He subsequently added several more stores throughout the south Bay, bringing what he called an “East Coast style” to San Jose and Silicon Valley for 62 years. This milestone deserves note for several reasons. Ed Mosher is a Spartan through and through; for decades, he has been a staunch supporter of SJSU arts and athletic programs. He has for decades been a major presence in our downtown. And, during National Veterans and Military Families Month, it especially is fitting to thank Ed for his post-college service as a United States Marine. I congratulate Ed on an exemplary career and look forward to his continued involvement with SJSU. Over the last several years, considerable time and attention has been devoted to studying and addressing chronic issues that have compromised students’ ability to complete their degrees in a timely fashion. The importance and benefits of shortening the time to a degree cannot be overstated. Students incur less debt and move more quickly to the next step in their lives; employers have access to a larger supply of talented, career-ready graduates; colleges and universities have greater capacity to admit the next wave of prospective students. Policymakers deservedly are giving these issues heightened attention. SJSU on November 1 hosted a hearing of the State Assembly’s Select Committee on California’s Higher Education Master Plan. The committee heard insights from experts on the importance of ensuring a steady supply of talented graduates to meet future workforce needs. We were privileged to serve as hosts to this important dialogue; I was invited to offer introductory remarks to the committee. In attempting to remediate obstacles to student achievement, there have been four areas of short-term focus, all requiring immediate attention: the readiness of incoming students to handle the rigors of college; the level of advising support available to help students navigate course selection and other choices; our ability to keep students engaged and at less risk of leaving without their degrees; and the prevalence of so-called “bottleneck” courses in which demand exceeds enrollment capacity. These factors and proposed solutions ultimately were embodied in a plan that has been implemented by leaders and staff in student affairs and academic affairs. There has been considerable progress across several priority areas; in advising alone, we have added 20 professional staff and launched an online application helping students navigate their paths toward graduation. I am grateful for all that many of you have done in support of this immensely important endeavor. The work has laid a foundation for all that we must do going forward. Much work remains if we are to meet or exceed all of the CSU’s Graduation Initiative 2025 goals. And while we have made progress, our four and six-year graduation rates continue to lag behind the goals we have set for ourselves. Toward this end, I am pleased to report that San Jose State has joined forces with EAB’s (Education Advisory Board) Student Success Collaborative, a consortium of more than 1,000 like-minded colleges and universities—including several of our CSU peers—collaboratively working to develop student success best practices. Among other things, EAB provides predictive analytics tools and easy-to-understand graphics that both will help us better understand the needs of our students while also helping faculty, staff advisors and others connect students to resources that best meet their unique needs. This EAB initiative truly is a collaboration; we have meaningful insights of our own to share with other institutions, and there is much we can learn from them. Our EAB partnership and related student success efforts will be guided by AVP for Student and Faculty Success Stacy Gleixner and AVP for Transition and Retention Services Debra Griffith. In the meantime, we also must elevate our sights and transition from operational tactics toward reimagining how we define and support student success. The answers, I am confident, lie in more than statistical measures. There are many areas and opportunities to explore, including an integrated first-year student experience combining classroom instruction and co-curricular programming; greater focus on student health and wellness; meta-majors, combining practical disciplines and critical thinking skills imbued by the liberal arts; and the increasingly important role of specialized resource centers in ensuring that our highest-risk students are fully equipped to succeed. Ensuring that every student is prepared for success in work and in life demands that we explore all of these ideas, and others. This is a vital conversation that must involve our entire campus community, and we have an opportunity to ensure broad engagement within the framework of our strategic planning initiative. This work further will be enhanced by soliciting and listening to input from our workforce partners and other community leaders. Our campus in September hosted a Western Association of Schools and Colleges Senior College and University Commission (WSCUC) Special Visit Team as a follow up to our 2015 re-accreditation. I am happy to share their summary report, which highlights the strides we have taken to reaffirm our commitment to shared governance; attain stability in leadership; and ensure that we meaningfully honor and support the goals of inclusivity, equity and diversity in pursuit of a healthier campus climate. The report also notes isolated areas for continued focus, which especially can inform and enrich our strategic planning process. The report affirms that many who met with the visiting team—students, staff, faculty and administrators—expressed optimism and enthusiasm in the wake of enhanced internal communication and increased transparency over the last two years. The visiting team especially was impressed with progress made in fostering a culture of diversity and inclusion, including our investment in an Office of Diversity, Equity and Inclusion and appointment of a cabinet-level chief diversity officer, and establishing African American/Black and Chicanx/Latinx student success centers, UndocuSpartan and related student resources and services. The summary report notes several areas for continued focus: improving communication with staff; attending to workplace quality-of-life issues; and investing in additional advising resources for students (a key area of progress we have made in student success efforts). I want to acknowledge the work of our Accreditation Review Committee and its chair, AVP of Graduate and Undergraduate Programs Thalia Anagnos, for guiding this process to a positive outcome in which we all can take pride. If we truly are committed to nurturing “student success” as a holistic experience that begins with admission to SJSU and culminates in the conferral of a degree, then the commencement experience deserves the same thoughtful analysis and attention that we are devoting to other steps along each student’s journey. Colleges and universities approach commencement in different ways, ranging from single large-scale ceremonies in arenas or stadiums to multiple events over several days organized by college or discipline. SJSU for many years has held its official commencement—the only ceremony at which degrees officially are conferred—in our football stadium on the Saturday of Memorial Day weekend. It has been preceded by dozens of smaller events sponsored by colleges, departments or affinity groups. Campus insights: can we do better? Based on preliminary conversations with students, faculty and staff members and a review of last spring’s commencement, it seemed timely thoughtfully to review our current commencement programming. Many students and others confuse unofficial celebrations (some of which are called convocations) with our official commencement. Many of the college, department and affinity ceremonies are scheduled close to or during final exams—a clear and problematic distraction for many students and faculty members. These smaller events vary significantly in scope—some are more elaborate than others; some charge special fees to students while others do not—resulting in an inequitable experience for graduates that wholly is contrary to SJSU’s values of inclusion, equity and access. I realize that contemplating changes to long-standing traditions is hard—especially when it involves important events that have followed a fairly fixed pattern for many years. Yet the inherent importance of this moment in our student’s lives makes it imperative that we strive properly and equitably to honor every graduate, officially confer their degrees, and ensure that they receive appropriate personal recognition. Meeting all of these goals and ensuring that the commencement experience is meaningful for all concerned is a tall order. It initially was our intent to consider only modest adjustments in 2018 while continuing to imagine more substantive changes in future years. However, accelerated progress on renovations to our South Campus facilities have forced our hand, rendering it unrealistic to use CEFCU stadium next spring. This framework involves staging several college-based commencement ceremonies over two days (Thursday, May 24 and Friday, May 25) at Avaya Stadium and the SJSU Events Center. Colleges would join together where appropriate to balance the number of graduates and guests at each ceremony. Every graduate would be individually recognized and personally congratulated on the platform by the President, Provost and appropriate Dean. Individual departments and affinity groups would continue to be empowered to organize their own informal celebratory events after the official University commencement ceremonies. We will discuss next spring adding a winter commencement ceremony in December 2018, thereby enabling mid-year graduates similarly to be honored upon completing all degree requirements. Every graduate would be personally recognized. Graduate students would enjoy a better, more personalized hooding experience. The formality of university commencement would be preserved and enhanced; departmental and affinity celebrations would continue at the discretion of individual organizers. As I have noted, the prospect of change brings questions and prompts understandable uncertainty. I intend in coming days to continue to solicit and listen carefully to input from campus stakeholders. I also know that additional details for next spring soon must be finalized so that students, families and others can make personal plans. Those details will be forthcoming soon. By placing student’s interests and needs first, I am confident that we will create a memorable, meaningful commencement experience that honors our most cherished traditions. Three members of our women’s swimming and diving team already are qualified for the 2018 NCAA Zone Championships. Congratulations! Several sports teams deserve mention. I want to extend one more “kudo” to our women’s soccer team for winning the Mountain West Conference regular-season championship. Men’s soccer deserves congratulations for reaching the Western Athletic Conference Tournament championship match by defeating twelfth-ranked Air Force. Meanwhile, men’s water polo entered its conference tournament ranked eleventh in the country, and women’s volleyball is wrapping up its best regular season since 2006. And women’s cross country placed an all-time best eighth in a 35-team field at the NCAA Regional Championships. Congratulations to all of our student-athletes and coaches for such stellar competitive efforts! Finally, we officially will dedicate our new tennis complex, the latest phase in a comprehensive renovation of our South Campus, on December 1. I look forward to participating in the ribbon-cutting for this beautiful facility. An array of tools is being installed to enhance campus safety and aid efforts by campus police to detect and respond to security threats that may arise. This includes a network of remote cameras in parking garages and other locations that have the capability to detect and pinpoint the location of gunshots. Although we hope never to have to take advantage of this feature, it will help university police more swiftly respond, as needed, if a shooting incident does occur. SJSU instructors Bettina Brockmann, Costanza Rampini and Tasha Reddy, who collaboratively teach a Global Climate Change course, recently arranged for their students to view An Inconvenient Sequel, a follow up documentary to the Oscar-winning An Inconvenient Truth. During a post-screening live webcast, SJSU student Akash Patel engaged in a brief 1:1 dialogue with former Vice President Al Gore. A healthy, growing endowment is essential to making our institutional aspirations and dreams a reality. I am proud to report that the endowment maintained by our Tower Foundation has, for the first time, topped $150 million. Endowment growth will be an important component of SJSU’s next comprehensive campaign. Kudos to VP for University Advancement and Tower CEO Paul Lanning and his team for hitting this threshold! Professor of Computer Science Cay Horstmann has been named by the Association for Computing Machinery (ACM) as one of a small group of “Pioneering Innovators… Advancing the Digital Age.” Professor Horstmann was among five society members recognized for educational contributions to computing. Congratulations! The Spartan Shops Board of Directors last week unanimously approved a resolution to establish a dining master plan aligned with our institutional mission. The resolution authorizes the board to issue a request for proposals (RFP) from outside entities to oversee food services at campus eateries, and to provide a performance improvement plan for our existing vendor with input from various campus stakeholders. This performance improvement plan will be presented to the Spartan Shops board at its next scheduled meeting on December 8. A recent article posted on San Jose Metro’s website lauded two recent programs sponsored by SJSU’s Center for Literary Arts—visits by Viet Thanh Nguyen, author of The Sympathizer, and William Finnegan, the Pulitzer Prize-winning author of Barbarian Days: A Surfing Life. This is further affirmation that we are on the way to becoming a fully engaged urban public university touching all aspects of life in our city and valley. I am grateful for all that you are doing to help fulfill this vision. Society entrusts public universities like ours with the responsibility to nurture the next generation of educated, engaged citizens. But we are more—much more—than conferrers of degrees. The midpoint of the fall semester is an apt moment to reflect on another of our vital responsibilities: public service. As the founding campus of the California State University and a long-standing member of both the American Association of State Colleges and Universities (AASCU) and the Association of Public & Land-Grant Universities (APLU), San Jose State University embraces each of the three pillars that collectively form our public mission: increasing degree completion and fostering student success; research and related scholarship; and meaningful public engagement. The third pillar—community engagement—is every bit as vital to fulfilling our mission as all that we do to educate students and advance knowledge through research and scholarly activities. Indeed, as I have said on a number of occasions, I believe that active, meaningful engagement between a university and its surrounding community animates and enhances all that we seek to do for students, our region and society. 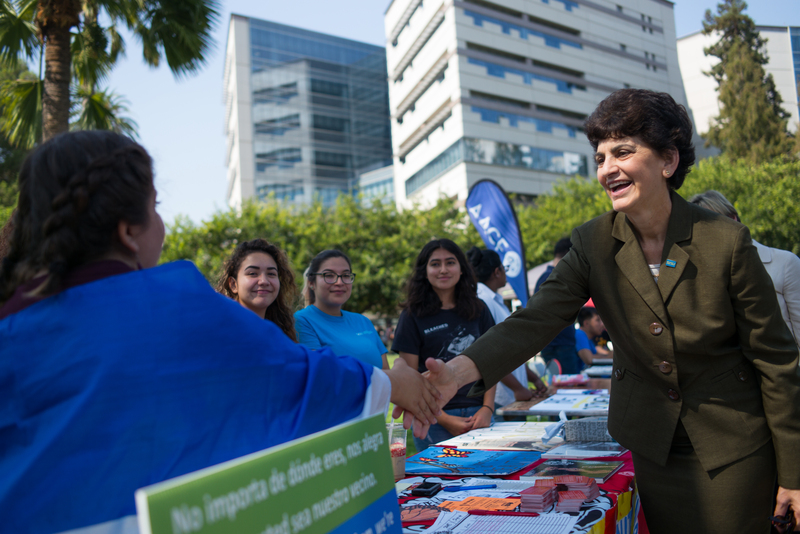 To that end, this month’s blog highlights some of the ways SJSU strategically is engaging—locally, regionally and nationally—with community partners in government and the private sector. There also are updates on several ongoing strategic initiatives, notable achievements by students, alumni and others, key upcoming events, and a remembrance of a legendary Spartan. Our public engagement efforts extend well beyond our city and region. To this end, I want to begin with a few reflections on the multiple raging wildfires that continue to inflict severe damage across our state, including multiple North Bay counties, Orange County, and elsewhere. Although the fires largely have been concentrated in multiple geographic areas, their impact has been felt and will continue to touch to every corner of our state and beyond. The skies above San Jose have reminded us of this in recent days. The numbers shared by authorities are staggering. As of this writing, officials have reported dozens of deaths; hundreds of persons unaccounted for; many thousands of structures destroyed; and hundreds of thousands of acres scorched. These numbers regrettably have continued to rise. As of the weekend, the wildfires had spread to vast swaths of the North Bay— including the wine country—and migrated east and north toward Solano county, posing a danger to communities there as well. Worse still, dry and windy conditions have compromised efforts by firefighters to contain these deadly, destructive blazes. Meteorologists say that shifting weather conditions later this week, including the possibility of rain to our north, may help. Our hearts of course go out to fire victims, including many members of the Sonoma State community. My Sonoma State colleague President Judy Sakaki and her husband Patrick lost their home; Executive Vice President and Provost Lisa Vollendorf, who previously led our College of Humanities and Arts, was forced to evacuate hers. Others of their employees similarly were impacted. The impact of the wildfires has been felt here as well. The family of at least one of our students lost its home. First responders, as ever, have responded heroically. We are grateful for their courage and skill. It is during times like these that we are reminded of the true meaning of selflessness and of the critical importance of lending a hand to others in need. I am proud to say that Spartans, as always, have risen to this challenge. Members of our faculty with uniquely relevant expertise regularly are being featured in regional and national news coverage. Students have hosted donation drives in support of fire victims; their latest effort continues through this Thursday. Other efforts have been focused on supporting members of our own CSU family. Locally, we have in recent days provided police, strategic communications, counseling and emergency management support to Sonoma State’s emergency operations center during a mandatory campus closure that is expected to be lifted later this week. As campus operations there stabilize, we will seek other ways to help. Many of our sister campuses also are joining in this effort. I encourage you to consider joining your CSU colleagues in providing much-needed support to fire victims through the Sonoma State Fire Victims Fund. This fund was established to provide victims with essentials to help get them through what surely will be a difficult recovery period. Finally, we are mindful of our sister campuses nearer to fires burning elsewhere in California, including the Orange County Canyon Fire 2 wildfires that burned thousands of acres and destroyed more than two dozen structures before containment efforts began to take hold late in the week. Our thoughts are with the victims of these fires and our CSU colleagues who have been affected or are involved in relief efforts. California State Senator Bob Wieckowski annually honors “Local Heroes” for impactful community service. The honorees—individuals and organizations with meaningful ties to Sen. Wieckowski’s district, which includes portions of Silicon Valley—are selected for noteworthy individual and institutional accomplishments that improve the quality of life for all community members. I am immensely proud to share that Spartans were represented among this year’s honorees, who were recognized by the senator at a September 28 ceremony. The Unity Award was presented to SJSU alumnus and noted sports sociologist Dr. Harry Edwards in honor of his tireless, decades-long efforts in support of human rights and social justice. Dr. Edwards, who received an honorary doctorate in 2016, has been deeply engaged in the launch and early development of our campus’s Institute for the Study of Sport, Society and Social Change and generously entrusted to our care many priceless artifacts from his personal archives. SJSU B.F.A. student Andy Nguyen also was honored by Senator Wieckowski for meaningful humanitarian and philanthropic efforts. Andy, who has used his expressive artistic skills to illuminate the plight of global refugees, is a past recipient of the CSU Trustee Scholar’s Award and volunteers for SJSU’s Generate program, which supports the unique needs of our first-generation students. I am grateful to Senator Wieckowski for honoring noteworthy community heroism, and I am immensely proud of these Spartans—one whose legendary efforts over many decades have had uncommon global impact, and another whose work is only getting started. Citizens of San Jose and Silicon Valley long have benefited from the tireless contributions of selfless individuals from public and private life, like those recently honored by Senator Wieckowski. As one would expect, many of these community heroes have had significant ties to SJSU. One such hero—SJSU alumna Shirley Lewis ’55—passed away earlier this month. She was 84. Lewis’ myriad accomplishments and testimonials from her many admirers easily could fill this blog. Lewis invested much of her life in community service: twelve years on the San Jose City Council; executive director of the San Jose Symphony and Youth Symphony; president of San Jose Rotary; president of the SJSU Alumni Association; a director for SPUR San Jose (a chapter of what formerly was known as the San Francisco Bay Area Planning and Urban Research Association). Mercury News columnist Scott Herhold aptly called Lewis’ passing the loss of an “authentic patriot.” He recalled the devotion and patience she brought to her work on the City Council and her uncommon openness to civil disagreement and dialogue—which I find especially noteworthy in today’s divisive political climate. In reading about Lewis, I especially am struck by her commitment to her own family—she raised six children, the first of whom was born while she was a married SJSU student—and to her native city, which was her extended family. A Mercury-News editorial headline may have said it best: “San Jose’s Shirley Lewis persisted in love for family and community.” On behalf of the Spartan family, I offer my condolences and best wishes to Shirley Lewis’ family and all who were fortunate enough to know her well. October is National Cybersecurity Awareness Month. As part of our broader academic and research efforts, this annual awareness-building month affords us the opportunity to help students explore opportunities in a globally-relevant field while heightening our collective awareness of threats to data and personal security. Ably supported by Virginia Lehmkuhl Dakhwe, program director of the Jay Pinson Center for Stem Education in our College of Science, members of SJSU’s Information Security (“InfoSec”) Club competed earlier this month in a two-day national data security competition hosted by Uber at its San Francisco headquarters. Public/private partnerships like these open doors to invaluable relationships benefiting students and faculty and foster productive relationships between SJSU and top technology companies like Uber and Cisco. Our involvement in national cybersecurity initiatives continues to deepen. The National Initiative for Cybersecurity Education (NICE) K-12 Cybersecurity Education Working group, co-chaired by Virginia, will stage its first annual Cybersecurity Career Awareness week early next month. Through a collaboration with the CSU, this program will help our local K-12 computer science initiatives—which encourage students, especially girls, to explore STEM education—better integrate cybersecurity career exploration into its activities. Last Thursday, our Information Technology office hosted Sasha Hellberg, Manager of Threat Research at Trend Micro, who shared insights from three decades of experience to illustrate the evolution of cyber-attacks, lessons learned, and best practices for enhancing cyber “hygiene.” She also spoke about technical and non-technical career opportunities. I encourage you to watch a recording of the presentation. There was very good news from Sacramento late last week. Governor Brown signed into law Assembly Bill 422, a bill granting full authority to the CSU to offer Doctor of Nursing Practice (DNP) degrees. SJSU was one of five CSU campuses selected to launch two pilot DNP programs—one each in northern and southern California—that began in 2012. The program, designed to ensure a steady flow of new nursing faculty throughout the state to keep up with demand in degree-based nursing programs, would have expired later this year without legislative authorization. The bill passed both houses of the legislature despite opposition from the legislative analyst’s office, which was hesitant to grant the CSU broader authority to offer doctoral degrees. As one of the participating pilot campuses, I earlier this year was proud to testify in support of the bill in a legislative policy committee. I share Dean Schutten’s pride in SJSU’s meaningful contributions to this very important outcome. Our commitment to Dreamers is well-documented. We were honored to host an October 5 press conference to commemorate Governor Brown’s signing of Assembly Bill 21, legislation authored by Assemblymember Ash Kalra (D-San Jose) strengthening DACA protections. I was privileged to stand alongside Assemblymember Kalra, SJSU Associated Students president Ariadna Manzo and assistant professor Patricia Lopez and help contextualize the importance of this legislation. I often have spoken about the important role played by a public university—especially one intrinsically linked to the affairs of an urban center like San Jose—as a convener of important conversations on issues of broad public import. Last week, amid heightened interest in the role of public art in community discourse, we hosted a panel discussion, moderated by former San Jose city councilmember Blanca Alvarado, that included SJSU alumnus and assistant professor of Mexican American studies Dr. Jonathan Alcanta and two SJSU faculty members: Mexican American Studies lecturer Gregorio Mora-Torres and Professor and Anthropology Department Chair Roberto Gonzalez. The panel explored the unique and somewhat misunderstood story of Quetzalcoatl, a Robert Graham sculpture in Plaza de Ceser Chavez. Representative Ro Khanna (D–CA) visits campus on Tuesday, Oct. 17. I will have the opportunity to engage in a conversation with Rep. Khanna on numerous national issues of relevance to us all. Also Tuesday evening we will host a public conversation concerning public art and, of local interest, the future fate of the Columbus statue in San Jose City Hall. We are partnering with the City of San Jose in convening this timely dialogue, featuring a strong panel of experts facilitated by SJSU political science professor and department chair Melinda Jackson. This Monday and Tuesday, Oct. 16-17, we welcome CSU government relations and public affairs staff from throughout the state for two days of discussion and professional development. Wednesday evening, Oct. 18 the Hammer Theatre Center will welcome decorated author Viet Thanh Nguyen, the celebrated Vietnamese author, MacArthur Genius awardee and Pulitzer Award recipient for his acclaimed novel, The Sympathizer. I also want to note the upcoming third anniversary of our agreement with the City of San Jose to operate the Hammer and bring the arts back to our downtown. The opportunity to revitalize an important venue for artistic expression through an eclectic mix of artistic, intellectual and cultural programming has been yet another reminder of the important role SJSU plays in enriching our region’s quality of life. We look forward to continuing this city/university partnership. Fall brings several unique opportunities to celebrate the accomplishments of individual students, faculty and staff as well as institutional icons. The 2017 class of CSU Trustee Scholars includes SJSU awardee Essy Barroso-Ramirez, a first-generation student studying public health, Mexican American studies and legal studies. A Phi Kappa Phi honor society member, Essy is an active participant in numerous campus organizations and is deeply committed to utilizing her education to “pay forward” the educational and societal opportunities that have been made available to her by others. Governor Jerry Brown’s recent appointment of SJSU Professor of World Languages and Literatures Romey Sabalius to the CSU Board of Trustees is yet another example of SJSU’s growing influence in matters of significant importance to our students, community and state. Professor Sabalius has served as a professor and coordinator of the German Program in our Department of Foreign Languages since 2003. He joined our campus as an associate professor in 1998. In order to be able to fully focus on his trustee responsibilities, he will step away from active service on the San José State University Academic Senate, California State University Academic Senate and the California Faculty Association San José State University Chapter Executive Board. I congratulate him on this two-year appointment. I was honored to participate late last month in a celebration of Reed Magazine’s 150 years of distinguished literary excellence as our state’s most venerable literary journal. This stellar model for faculty/student collaboration and experiential learning has nurtured the aspirations of countless writers and solidified SJSU’s relevance in the humanities and liberal arts—an essential ingredient in fulfilling our mission, as I often have said. Congratulations to Associate Professor and Reed Editor-in-Chief Cathleen Miller, her editorial team and all of the Spartans who have contributed to this journal’s remarkable 150-year legacy. Nominations for the 2017-2018 Faculty Outstanding Lecturer Award, Distinguished Service Award, Outstanding Professor Award, and President’s Scholar Award as provided by University Policy S13-6 are being accepted through October 31. I encourage you to review the nomination criteria for each award and offer your input to the Academic Senate office by completing its online nomination form, in writing to extended zip 0024, or in person to ADM 176 by 5:00 p.m. on Oct. 31. I was pleased to see that 330 individuals participated in early strategic planning conversations last month during our kickoff events. I also know that our students, staff, and faculty have many more ideas to contribute. You can share your insights by completing our online Strategic Planning survey through October 22. As we develop collaboratively a strategic plan to guide us over the next decade, it will be valuable to think about how to enrich SJSU’s community impact. We have a strong foundation on which to build, and our efforts in this area will be as essential as anything we do to realize our potential to become a preeminent urban public university. Updates on this important journey toward a long-term campus planning roadmap will be posted to our strategic planning website. With fall sports in full swing, we can take pride in many first-half season accomplishments. Our first-place women’s soccer team later this month will be poised to seek its second Mountain West Tournament championship in three years. Our women’s cross-country team has won its last three races and will seek to extend that streak at the Mountain West Conference championship meet on October 27 in Albuquerque, N.M. Finally, men’s water polo—which returned in 2015 after a 34-year absence, has a winning record, is nationally ranked, and has seven home matches remaining before its mid-November conference championship tournament. A joyful parade through campus. A loud, intense Fire on the Fountain rally. A competitive battle between SJSU and long-standing rival Fresno St. for possession of the Valley Trophy. Homecoming Week 2017 was memorable in many ways—none more so than the indomitable spirit of Spartan pride displayed at these events and others throughout the week. I was immensely proud of our community and heartened by the energy and spirit from students, faculty and staff, alumni and our many other supporters. My sincere thanks—and a big Spartan Up—to all of you. Our thoughts are with the Sonoma State University community and my colleague President Judy Sakaki, as well as the many others coping with multiple wildfires that erupted on Sunday across a wide swath of Sonoma and Napa counties. As of mid-morning, the fires had destroyed at least 1,500 structures—including President Sakaki’s home—and prompted large-scale evacuations. The Sonoma campus has suspended classes and routine business operations today and tomorrow, but remained open as of late Monday morning. Our staff has begun reaching out to the approximately 250 SJSU students from Sonoma and Napa counties, offering information about counseling and financial resources. Students also can contact our Economic Crisis Response Team, which assists students experiencing financial crises, for information and support. On behalf of the entire San Jose State community, I offer heartfelt concern for the safety and well-being of everyone affected by these wildfires. We will continue doing all that we can to lend appropriate support. Like all of you, I am deeply saddened by news of yet another tragic shooting at what should have been a safe event. Please join me in sending your thoughts and prayers to those who have been affected by the tragedy in Las Vegas. While all members of the San Jose State football team, cheer team and marching band returned safely after our game Saturday night at UNLV, my heart goes out to our friends there. A college campus so close to the site of an event like this one is undoubtedly struggling to come to terms with it. I am mindful of those on our campus who may be personally impacted. This morning, our Student Affairs team reached out to each of SJSU’s 48 students from Nevada, including 20 from Las Vegas. Please remember that counseling is available at no cost to all students and to all faculty and staff members. It is my hope that all of you will reach out to your loved ones and friends today. The Spartan family is large, with more than 250,000 alumni, 33,000 students, and 5,000 faculty and staff members. We will provide updates as appropriate. Capt. 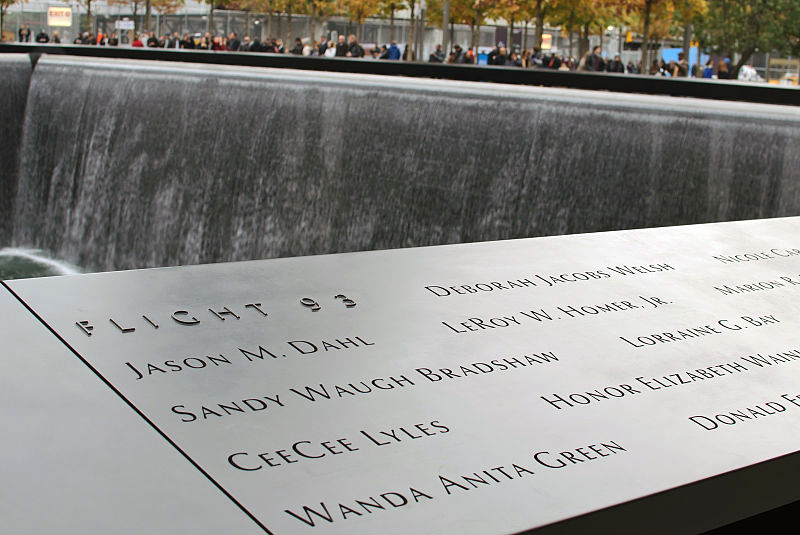 Jason Dahl, an SJSU alumnus, and his crew are memorialized at The National September 11 Memorial Museum in New York (Photo: skinnylawyer, Wikimedia Commons). Editor’s note: The following message was emailed to all students, faculty and staff at 9:30 a.m. Sept. 11, 2017. As we watch with deep concern the devastating hurricanes pummeling the southeastern United States and Caribbean, we pause this morning to remember the acts of terror on American soil 16 years ago today that stunned and forever changed our nation. Many of our students were so young at the time that it is unlikely they recall the chilling details. Dennis and I were working and living in Michigan at the time, but I subsequently served for twelve years on campuses in New Jersey, New York and Connecticut and repeatedly encountered the painful, personal aftermath of the 9/11 attacks. That pain was no stranger to the San Jose State community. 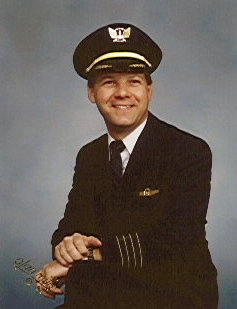 Captain Jason Dahl, ’80 Aeronautics Operations, was at the helm of United Flight 93 when it crashed in western Pennsylvania after passengers and crew fought back against terrorists’ efforts to commandeer the plane. Aviation program faculty, students and staff have paused each September 11 to remember Captain Dahl. Today, in honoring the memory of all who lost their lives on that fateful day, we especially remember one of our own for his heroism and bravery. 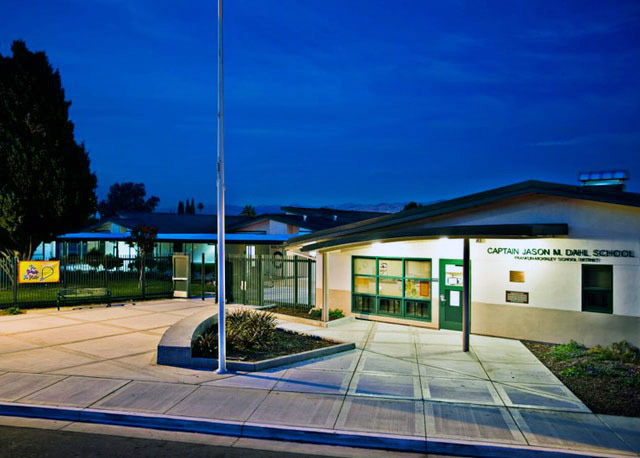 A San Jose elementary school was renamed in Capt. Dahl’s honor (Photo: Sugimura Finney Architects).